Every so often the skeletons in my closet create such a raucous that the chained and locked closet door shakes tremendously, and I am left to deal with it. Because the closet is my awesome mind that often, if not always, I would rather ignore, add more locks, possibly bolt it down, or even add that heavy plank of wood across the door like in the olden days. Yet it is more overwhelming to simply ignore. The clamour is unyielding to the point of seeing steam creeping out of it, with grunting noises on the other side, scratching sounds on the floor, and dreaded pounding on this demon door. Such is the threat my own non-yogic mind creates. At that moment, I sense a bull, a fighting bull in the arena of my mind. There are always choices to make. I can run; but we all know the bull only catches up with me. I can scream at it until my lungs burst; but this would simply enrage the bull more. Or I can stand still, and relish that unfathomable excitement of waiting… waiting for the initial charge of the Toro. Only in stillness can I plant my yogic-feet on the ground. As a moment of silence is a melody in music, so is standing still, a step in dancing. Only in stillness can I build confidence to face the bull. It will be like watching the attack in slow motion. And only then will I be able to live each passing second and learn to appreciate each intake of breath. I stand still with my arms poised clutching my superhero cape. 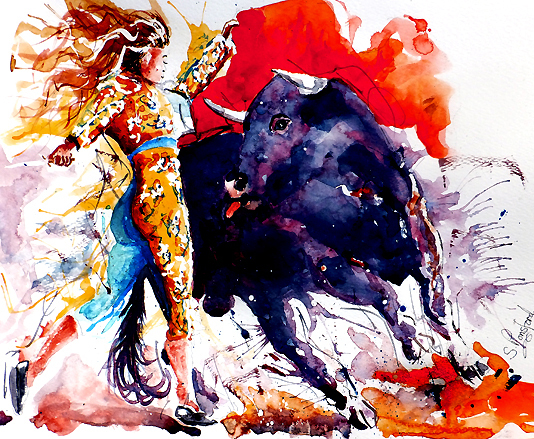 Through the many bullfights, I have learned the dance. 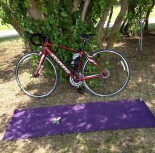 Not a master; but a learning yogini- torero. I wait for the charge. The rhythm of the stillness is maddening, invading the gist of my spirit, the core of my soul. But I welcome the anxiety. It is beauty, reflected upon the strength of the bull and confidence of a yogini. I am holding ground. I deeply apologize for the display of animal cruelty; but in essence, it is the description my words manifested. Throughout most lives we were made to believe that when you ignore something, it will eventually go away. There always has to be the closure; else it haunts us at no end. And when we need to come face to face, then so be it. It may cause a great impact as the charge comes… but won’t we rather have that than live with ghost shadows until we ran out of breath?